It’s funny how things work out. The way life’s puzzle pieces always end up fitting together. 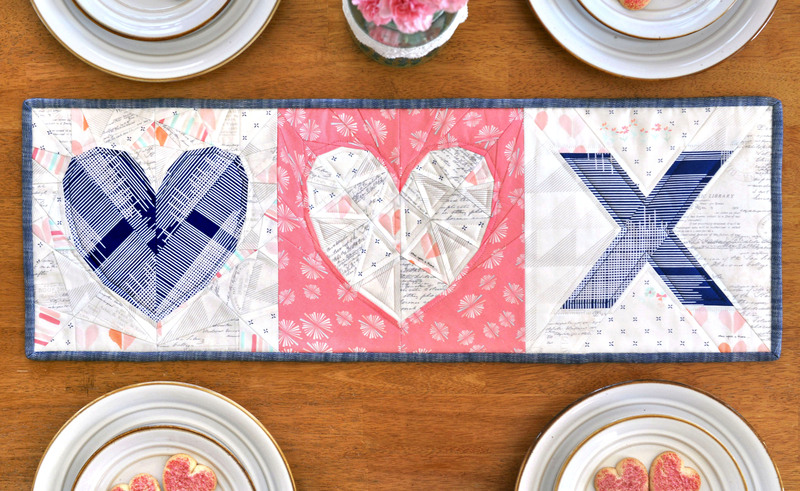 I first designed the Love Story Pattern for my class at the Swapaholics Retreat last September. Amy Sinibaldi was also teaching and her debut fabric line, Paperie, had not yet been announced when I was prepping for the retreat. Flash forward a few months to 2016. 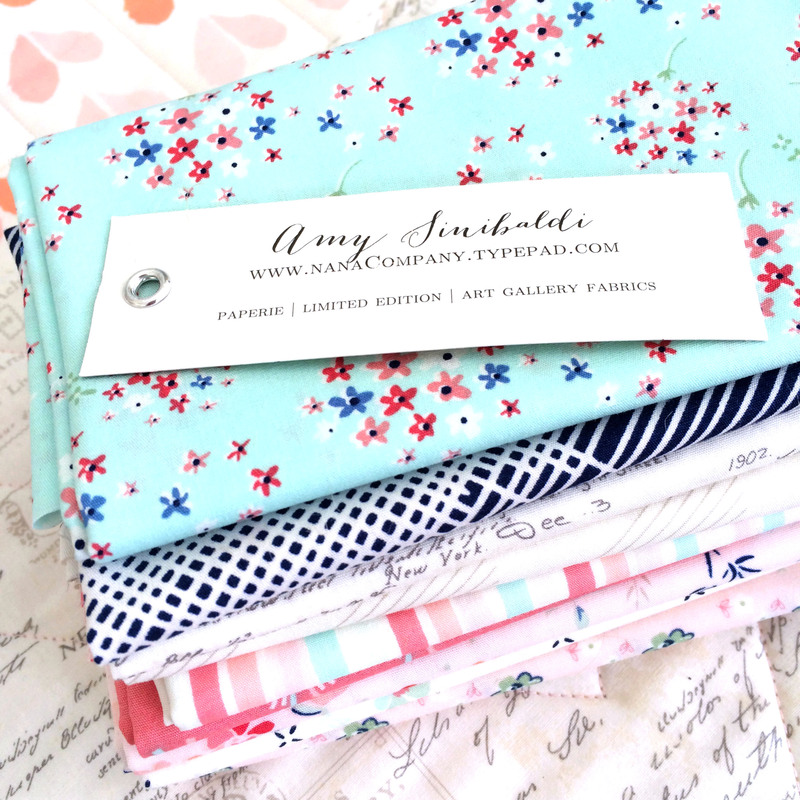 I’m amping up my pattern in preparation for release and Amy invites me to join her Paperie Blog Tour. I think you’ll see that her fabric and this pattern go together like sprinkles and donuts. And not that pink hearts are ONLY for Valentine’s day, but what perfect timing, wouldn’t you say? As usual, I had trouble wrangling in all my ideas. 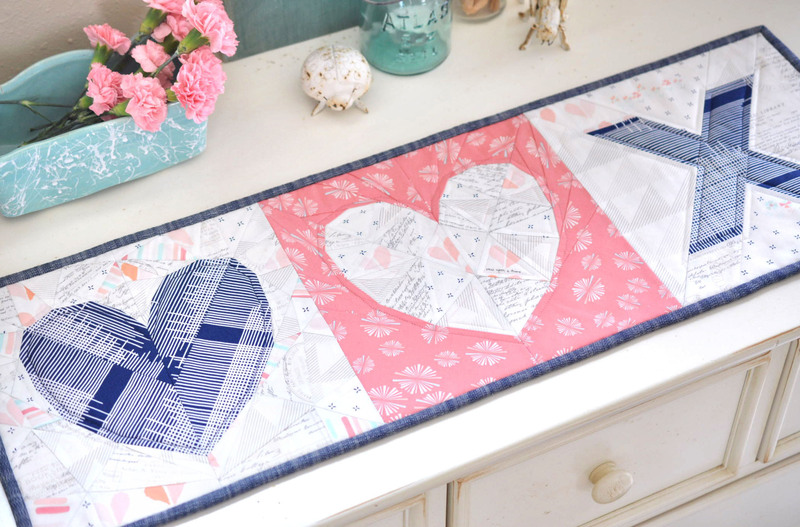 I did know for certain that first I wanted to make my Undercover Maker Mat (download the free pattern here) using the 5″ Love Story block in place of the butterfly charm block used on the original. 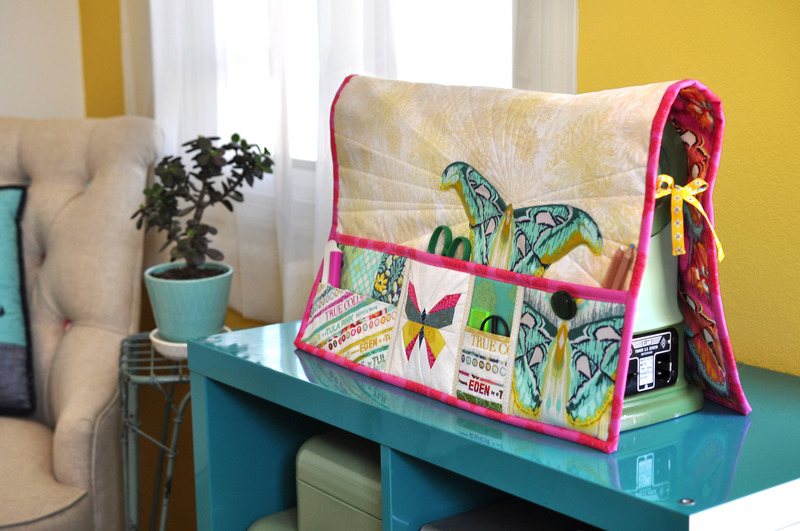 This mat is such a fun and useful project that sews up quick and lets you showcase your favorite fabrics. I decided to make the secondary pockets on this one in solid prints, rather than the selvedges, so I could really show off the line. I was torn between using the texty print or the hearts for the main body of the mat, but now that it’s all finished, I don’t know how it was even a question. The text is just perfect and the strip of hearts pieced in just plain makes me happy! I then carried the heart print over to the removable thread catcher by piecing a strip into the front and using it on the lining. I think it really just balances it all out perfectly. I used a delicate pink chevron trim on the pocket panel and added a bit of crochet lace on the secondary pocket – in true Amy style! Thanks to the expert advice my official quilter, Sari, I went with a large chevron pattern for the quilting on the mat body. It echos the seams of the heart block perfectly (thank you very much) and also ties in the trim. I used a pale pink Aurifil thread that gives it just the tiniest hint of color and I couldn’t love it more! I kept trying to find a way to use this pretty aqua trim on the pocket panel, but it just felt overpowering. It did, however, work out perfectly for the side ties! So, what do you think? Is this mat your style? I’ll be giving it away on Instagram next week (and a bundle of fabric! ), so stay tuned for that! Another idea that I just knew I had to run with was designing an X block that coordinated with Love Story. Like Xs and Os, but with a cute heart instead! I’m calling it Cross my Heart and you can download it for free here. I thought it would be an adorable mini quilt with 4 blocks in a large square, or as a set of pillows (or a two sided pillow!) 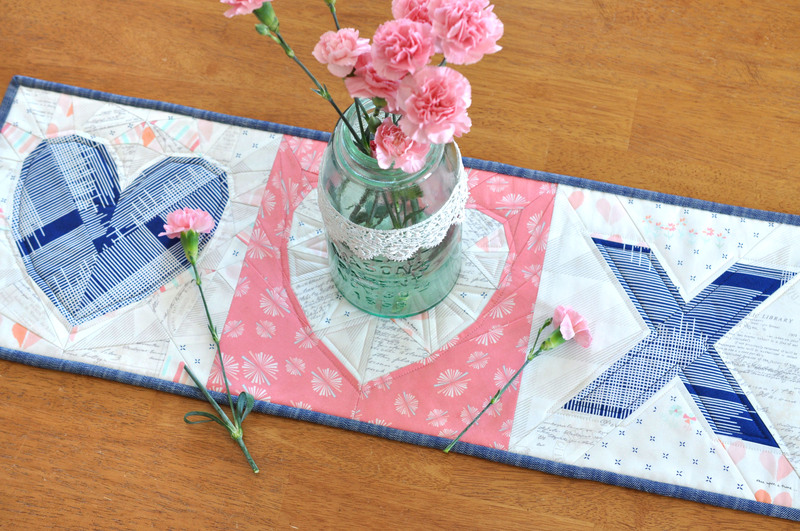 or a table runner, which is what I decided to make for my sample project. 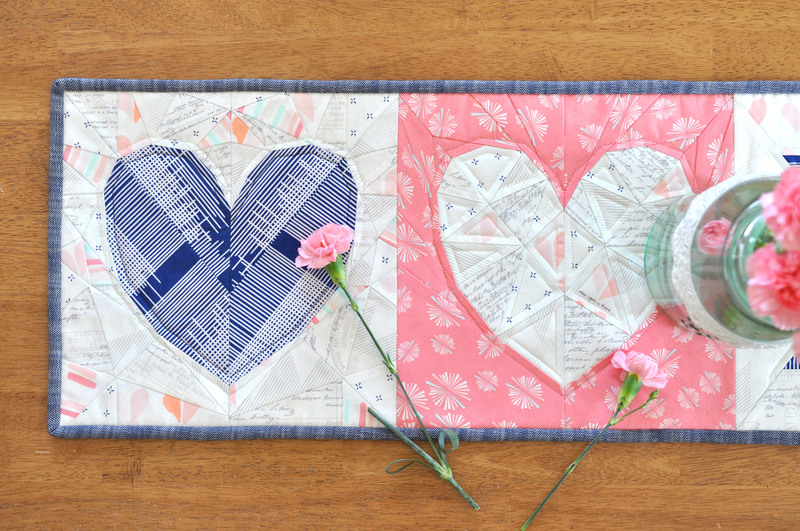 My Love Story pattern includes two block designs – Poetry (the pink block) and Prose (the navy and white block). I wanted to showcase them both, along with the X, so I thought a little asymmetry would be fun! I used the 10″ blocks here, and the X pattern also includes a 5″ block (how about a set of heart and X coasters?!). I love how striking the bold pops of pink and navy in this line are mixed with all the beautiful, soft low volumes. By random chance, I had a piece of my favorite chambray denim on my cutting table when I was feverishly trying to decide what to bind my runner with. It was a match made in heaven! The denim pairs so amazingly with this line, it started my mind racing with quilt ideas using Paperie and the new Art Gallery denim line that is coming out soon. SO EXCITED! I’ll be sharing some design ideas and other fun Love Story projects (including a lap quilt pattern) here and on my Instagram feed over the next couple weeks. You can also check the hashtags #lovestorypattern and #crossmyheartpattern for more inspiration. As always, I can’t wait to see what you all create! Be sure to check out all the other stops on the Paperie Blog Tour for all sorts of swoon worthy projects! 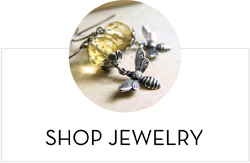 You can find links and photos in Amy’s instagram feed and on her blog. Now I am in desperate need of a nap! So I will leave you with some more eye candy inspiration! Above is the original Love Story block as it was designed to fit my flex frame pouch project for the retreat. For the pattern release, I squared off the block and made a coordinating reverse design where the heart is solid and the background is faceted instead. I love the possibilities this opens up for color play and layout ideas! Here are just a few blocks that my amazing testers sewed up. I’ll be sharing their finished projects soon! You can pick up a copy of the pattern on sale for $6.50 now thru Valentine’s Day in my Payhip, Etsy or Craftsy shops. This festive mini quilt measures 22” x 26” and features my Butterfly Charm Block patterns with a little Gidget tree topper. It’s perfect for hanging on a door or anywhere you don’t have room for a real tree! Click here or the image below to download the PDF pattern. If you have any questions about the pattern, feel free to contact me anytime. Tag your photos with #festivefluttertree and #butterflycharmblocks so everyone can be inspired! 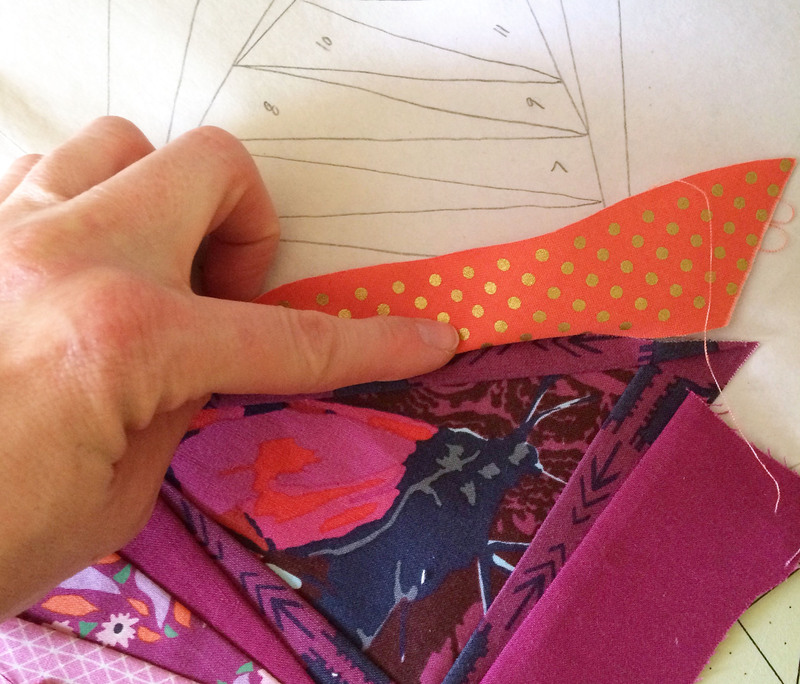 Yesterday I covered a few tips and tricks for preparing your pattern pieces and today we’re going to get into the hardest part of this pattern — designing your layout and selecting your fabrics. There are a lot of pieces and so many possibilities! 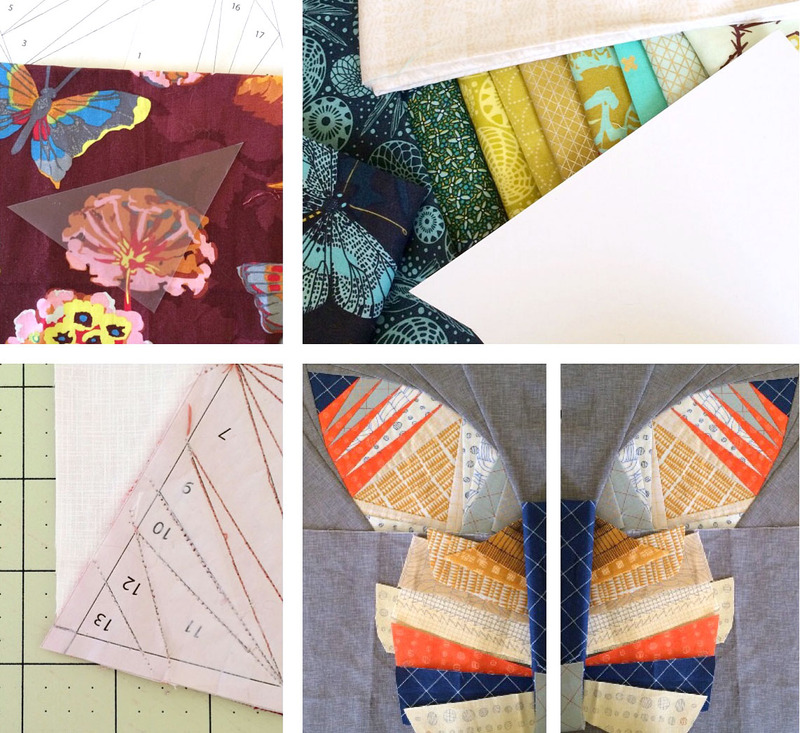 I’ll be covering a few ways to go about choosing and auditioning your fabrics, how to get good symmetry between wings and then I’ll close with tons of examples and inspiration from others who have sewn up the pattern. 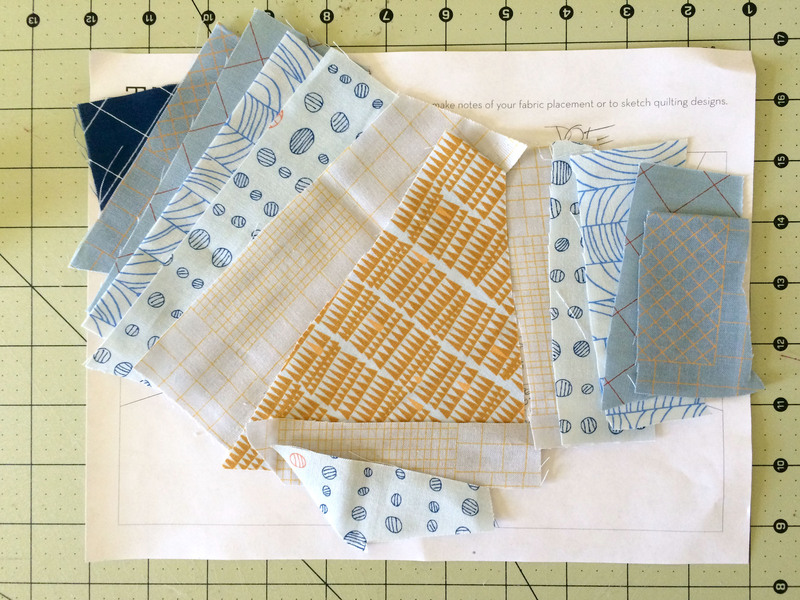 I have thus far approached my planning in four different ways – by color scheme, by fabric line, by fabric designer and by using a focal fabric as inspiration. 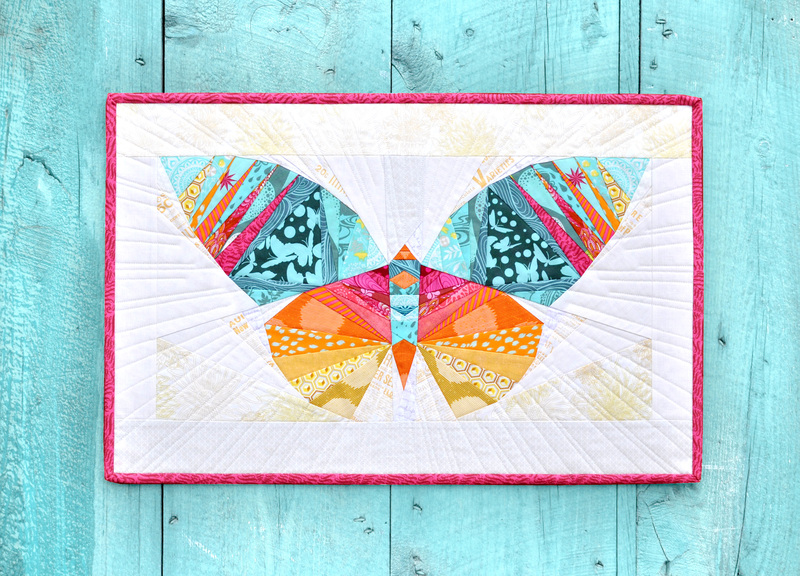 I always find myself gravitating towards color gradients when creating a new butterfly, probably because that is how I originally envisioned and designed the pattern, but I’ve been working on breaking out of that box and experimenting with different layouts. I usually do this on the computer (because I can!) but I also love to sit with a box of colored pencils, especially when I’m on the road or killing time waiting for appointments and such. I’ve been working on mimicking some real life butterflies such as the monarch and swallowtail (shown left above) and I totally love them! These examples can give you some ideas for colors and different ways you can accent areas of the pattern. Once you have a rough idea in mind, you can start selecting fabrics. I tend to lean most towards planning with a color scheme because it gives you infinite flexibility, but it also requires a lot of fabric. I don’t have a very large stash of fabric that isn’t reserved for a specific project. I also don’t have a lot of basics, blenders or solids, because what I love about fabrics are the patterns! This makes creating a gradient with 13 different fabrics pretty tough, but still totally doable! 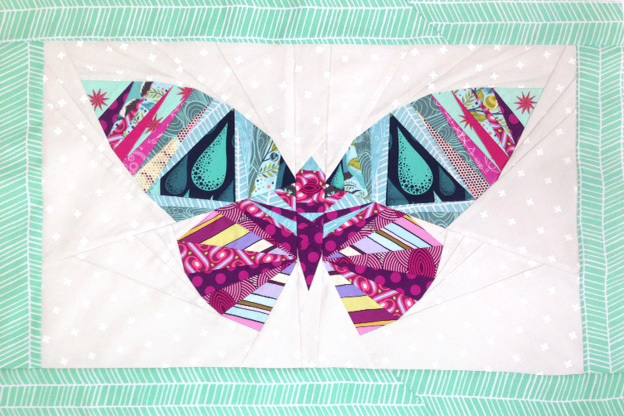 Most of the butterfly requires small pieces of fabric, so it’s easy to pull from scraps or charm pack leftovers. You can also look at fat eighth bundles or layer cakes for a project like this. The cotton + steel basics line is fantastic and I also love the moda grunge basics to add some good blenders into your project. 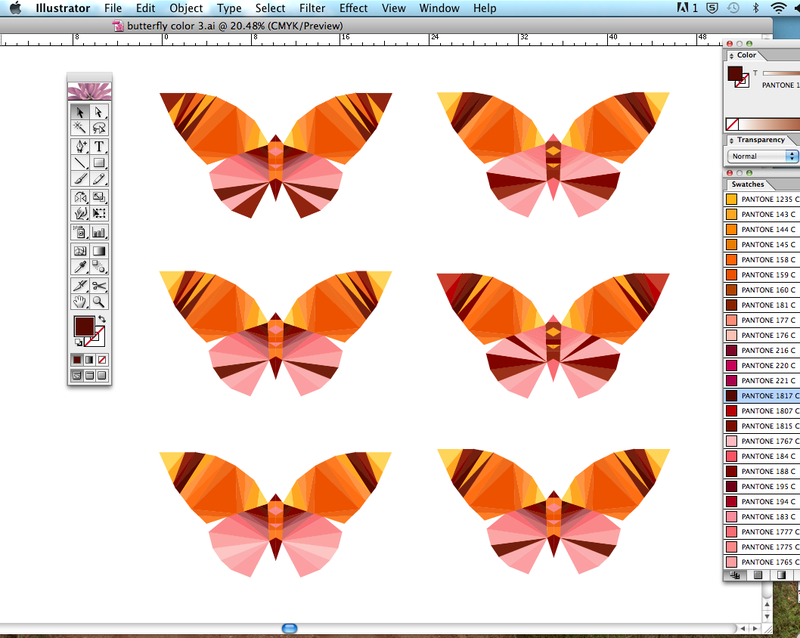 That being said, I decided to try creating some butterflies using a single fabric line and see how it worked. I’ve started this with two lines so far – Doe by Carolyn Friedlander and Fresh Cut by Basic Gray. The Doe line is smaller and I actually only used about half of it, but I love the way it’s coming out. You can see my initial computerized color mock ups on the right in the previous photo and how I implemented it (minus the orange accents) in the photo directly above. I decided to use the mockup shown in the upper left corner. The Fresh Cut line (shown above) is much larger so I have plenty of fabrics to work with. For this layout, I used a mini charm pack to play around with options (seriously, I LOVE mini charm packs! ), taking photos of each and comparing them later. In my photos above I’m laying out the top wing and bottom wing, with the background in the middle. So, while you will have less flexibility when working within one single fabric line, it’s entirely possible! 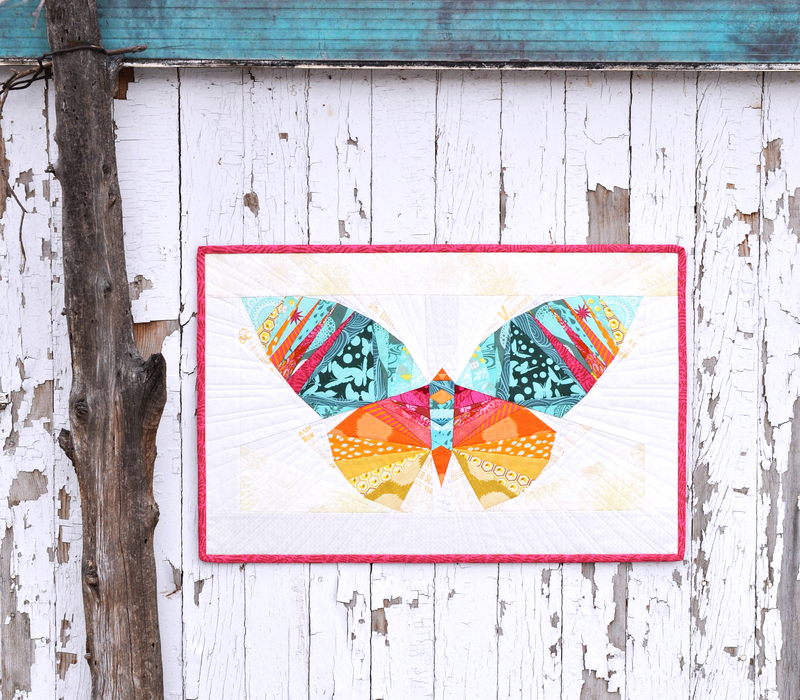 A FE bundle or layer cake would be more than enough fabric to complete the butterfly, with the exception of the background where you need about a half yard. The image above shows a couple mockups I was working on based on color scheme. The one on the left is a great example of all the ways you can change the look of the butterfly with your fabric placement. The ones on the right are similar to my original just using a different color palette. You will see this one implemented further down in the post. When Im pulling fabric for a layout based on color scheme, I start by grabbing all the fabrics I have in those color families. I then begin organize them in a row, taking out ones I don’t like, seeing if I have enough pieces and where I need to fill in or rearrange. I personally try to avoid using a lot of fabrics with bold prints or strong contrast, which is just a personal preference. 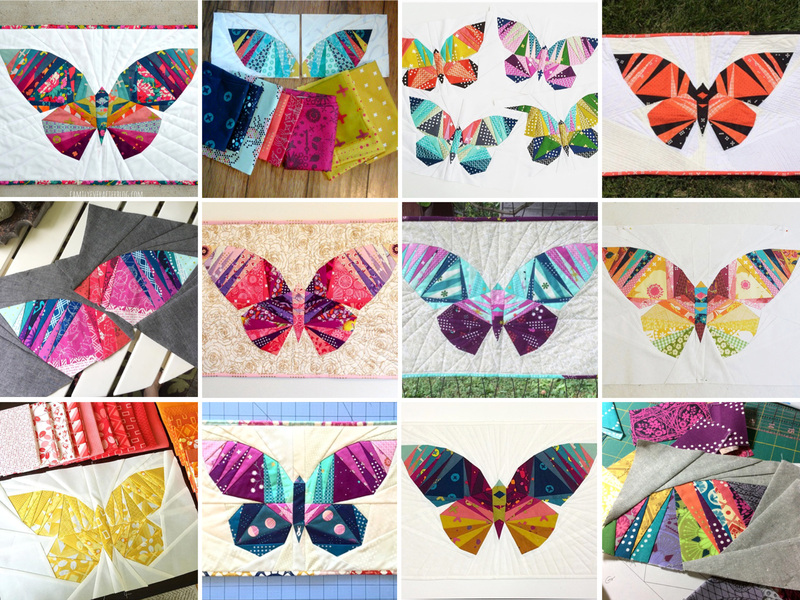 However, when I see all the butterflies other people are creating (check the #takewingpattern hastag on IG or the images at the end of this post), I always love them when they are complete, even if I would have never chosen the fabrics myself. I like to find a few multicolored, patterned fabrics to use as transitions between colors and use more solids, low volume or blenders in between. I lay pieces out in an overlapping row and find it helpful to cover the edges with my background fabric in the approximate shape of the wing and take photos to look back at later with fresh eyes. Snapping pics of your options is also a helpful tool in looking at your overall final layout. Seeing the whole thing in a mock up really makes a big difference versus looking at half. 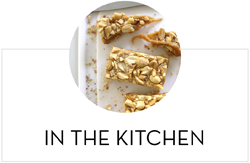 A really helpful tool for doing this easily is a photo app for your phone. I use pic jointer, because it was free and it’s on my phone! There are several out there, and I’m sure there are more sophisticated ones, but that one works great for me. 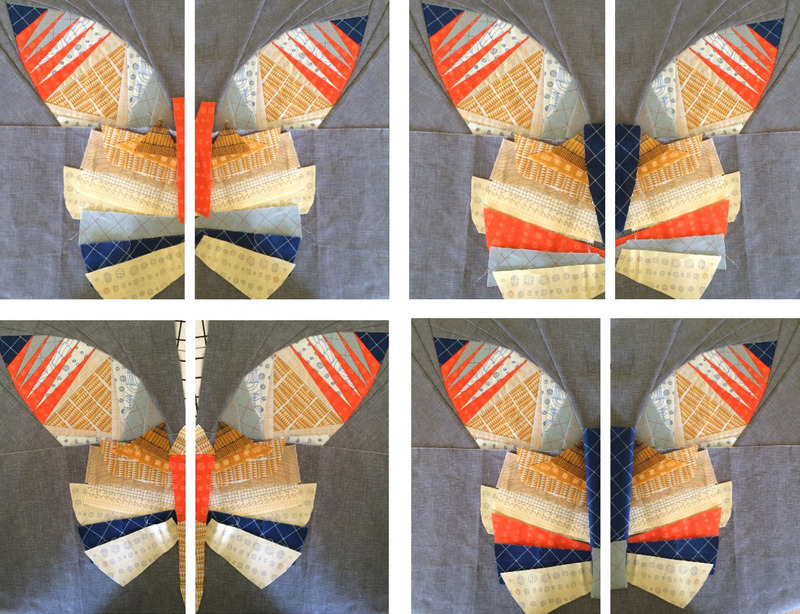 I lay out one wing or half my butterfly and then use a two-up or four-up frame to drop in the pics, mirroring half, and seeing my entire layout (shown a few photos down). You can also use this method to easily compare multiple options as shown below. Here I’m deciding which focal fabric to use in my top wing and which direction to run the maroon to pink color gradient. Which is your favorite? The large triangle of the top wing lends itself perfectly to a great fussy cut focal image (and I’ll talk about cutting these next). As you can see above, I have trouble deciding! This is often where my inspiration comes from. Look at fabrics you love with great focals as a starting point for your color scheme or fabric layout. I’m currently planning a bed size Take Wing quilt using all of Tula Pink’s lines and I plan to use her fantastic focals inside this large area — the parisville cameos, birds & bees squirrels, etc. I can’t wait! When I’m laying out fabrics, I keep them uncut until I’m fairly certain I like them, and then I cut my pieces roughly to the approximate shape of the pattern areas using the lines I traced onto the back of my pattern pieces (because remember if you use the front, your pieces will be backwards!). Some people prefer to use large pieces of fabric and cut off after they sew, but that’s another personal preference. I find layout and sewing easier and faster when I precut. It may be a tad more wasteful, though not much. Sometimes I end up changing my mind after cutting up my fabrics and laying them out (or even sewing them! ), but I just cut a new piece and save the other for another time. You will see my initial fabric pieces for the wing shown above and then the final wing. After piecing it, I decided to change a few pieces out. This pattern is designed so that you are adding all of the background pieces last, which I find helpful for the indecisive! It’s not impossible to change out pieces of your wings and I also often wait until my wing pieces are sewn before deciding on a background. When it comes to the butterfly body, I do sketch out the colors during my initial planning, but I often piece that section last and audition some options after I have the wings pieced. I find it amazing how different the overall design can look by changing this little section. Here you can see the same Doe wings with four different lower wing accents and body options (I went with the bottom right, what do you think?). I used the pic jointer app again to create these mock ups. 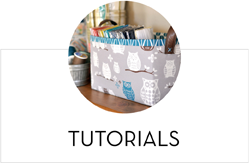 If you’re not using a piece of fabric or a fabric line as inspiration, another great way to find ideas is from social media, especially fabric designers and fabric shops selling bundles. Browse their IG feeds and email newsletters. 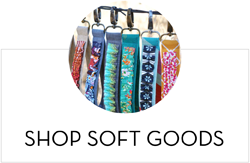 The pic on the left below was from a fabric shop email newsletter I received (I really meant to remember who it was from and credit them, but I totally failed, so I apologize!) and the pic on the right is from Carolyn Friedlander’s IG feed. These are helpful in getting ideas for both color schemes AND fabric selections. 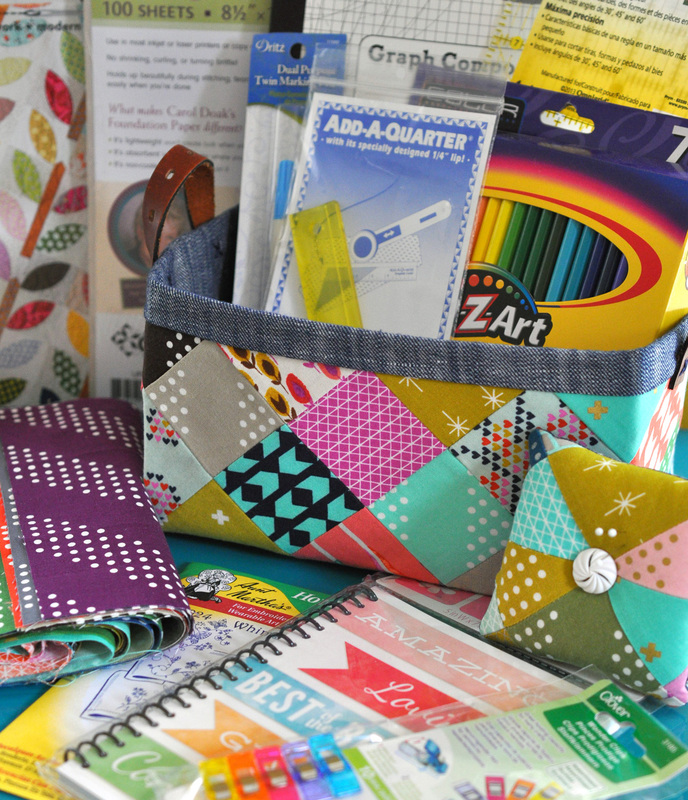 The fat quarter fun bundles from Stitch Supply Co always give me great ideas, too (shown below)! Mixed bundles like these are perfect for projects like this. 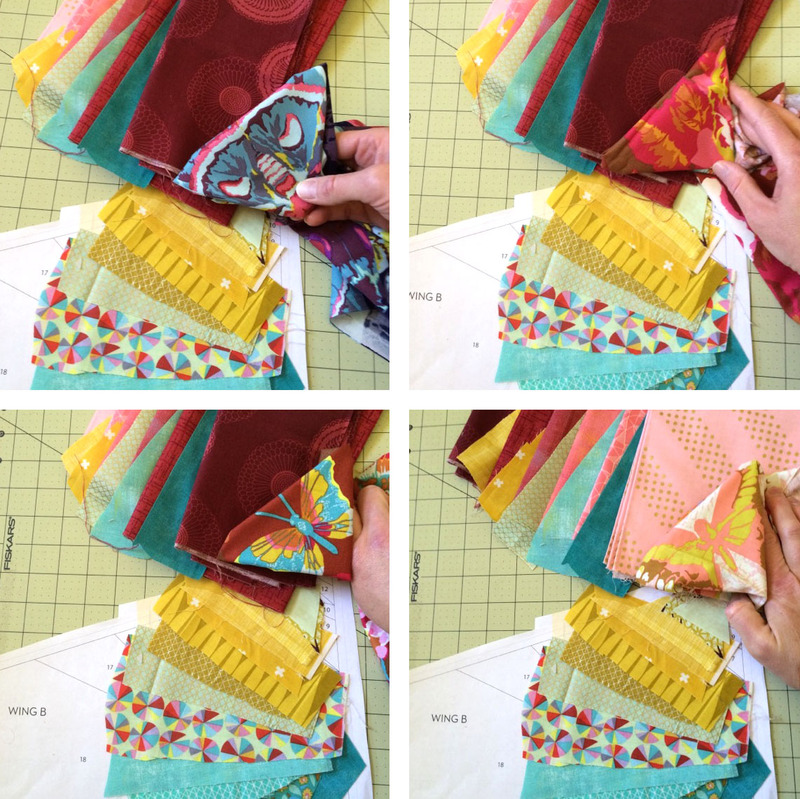 You can buy just a few fat quarters, rather than entire bundles, and add in some extras from your own stash. 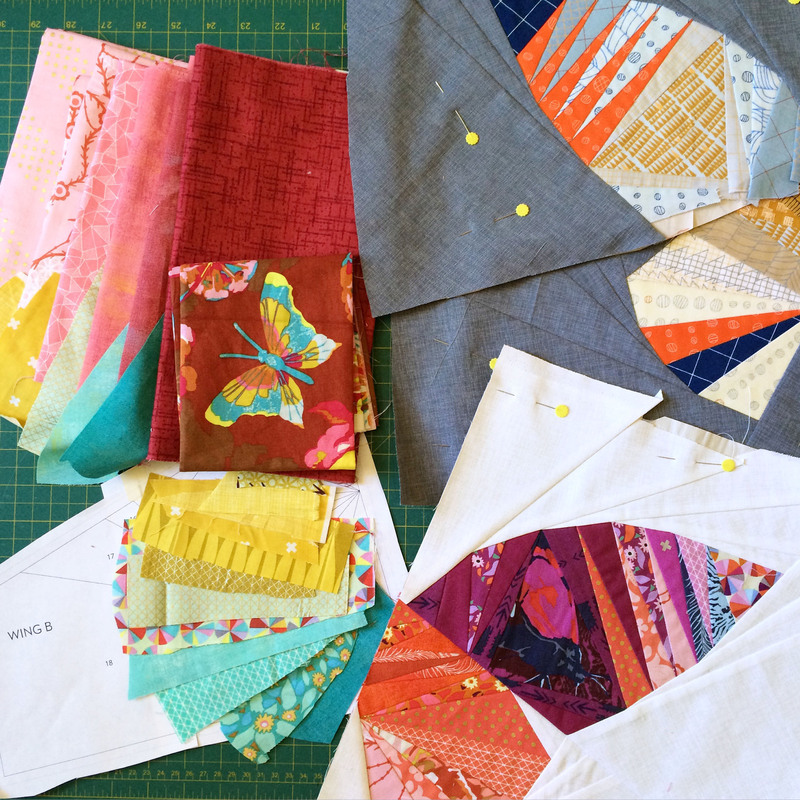 The fabric destash on Instagram (#thegreatfabricdestash) is another great place to find mixed bundles and scrap packs. 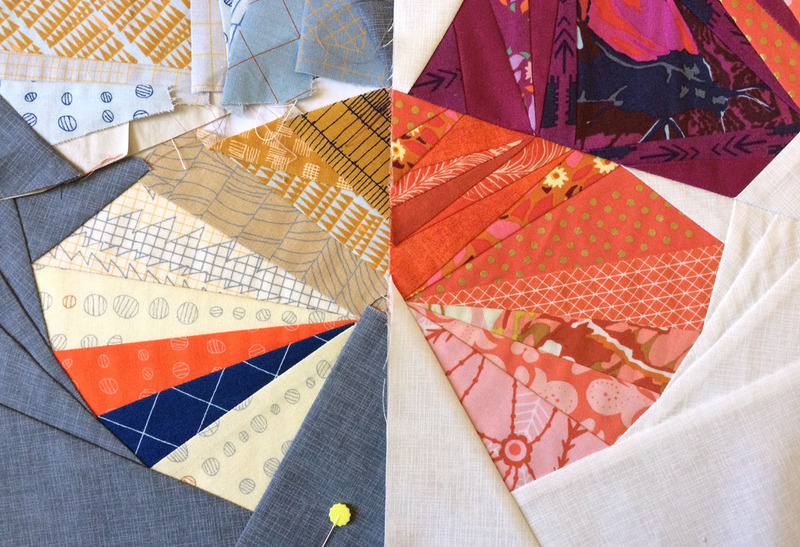 Fresh Squeezed Fabrics also sells some beautiful mixed bundles that would make fabulous butterfly starters! I’m not a big fan of using solids typically (no idea why, I just need at least a little texture! ), but they do lend themselves beautifully to this project. Kona, RJR and Robert Kaufman all put together some pretty awesome solids bundles with really interesting color combinations. 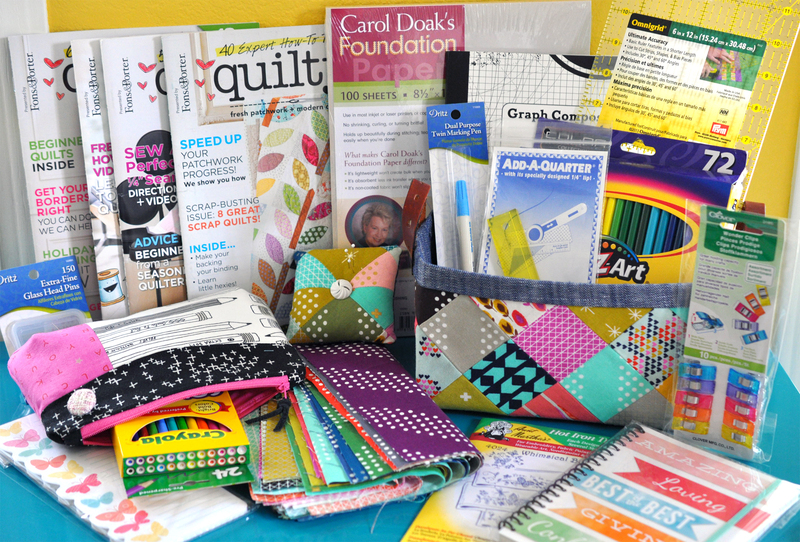 You can pick up charm packs, layer cakes, jelly rolls or FQ bundles at places like Fat Quarter Shop, Craftsy, Missouri Quilt Co and on Etsy. 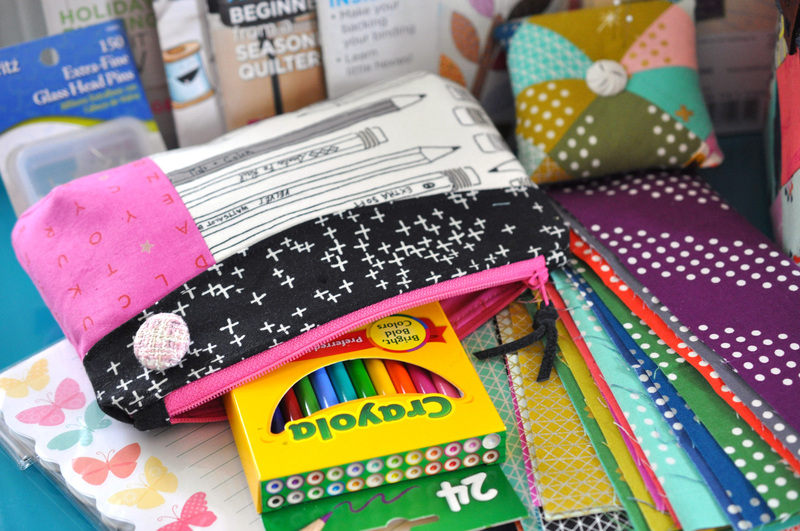 This Patchwork City Winter bundle is especially gorgeous! Now let’s talk about fussy cutting and wing symmetry! If you are using any fabrics with strong pattern, contrast, or focal images, it’s challenging (but important!) to get good balance between the left and right wings. Here are two ways to make it easier! First is to use template plastic. You can find this at many local quilt shops and large fabric stores and it usually comes in 18 x 12 sheets. Simply lay the plastic on top of your pattern piece, trace around an area and cut the plastic to size. You can then lay this template on top of your fabrics to audition options and you can also use it to trace the shape and cut out your pieces, just be sure to include an extra 1/4″ around your shape for your seam allowances. Also remember that the two wings are mirror images of each other, so flip the template piece over when cutting the second wing! You may find it helpful to mark L and R or something similar on the two sides of the plastic so you don’t end up cutting two of the same. A second option is to use paper. Print an extra copy of the pattern piece you’d like to use and cut out the specified area, leaving everything around in tact. You can then use this in the same manner as the template plastic. Lay it over your fabric, trace inside your lines, then cut your fabric piece 1/4″ larger than the shape. Again, remember to flip it for the second wing! These examples are shown using the large triangle area of the top wing, but this method can be applied to any section in the pattern. I could talk about fabric for days, but ultimately, seeing examples helps more than anything, right? Here are photos that have been sent to me or that I found under the #takewingpattern hashtag on Instagram. I am just blown away by the creativity and variations! Which is your favorite? This version, made by chickenjulie, was finished the morning after I released the pattern! I was totally blown away. 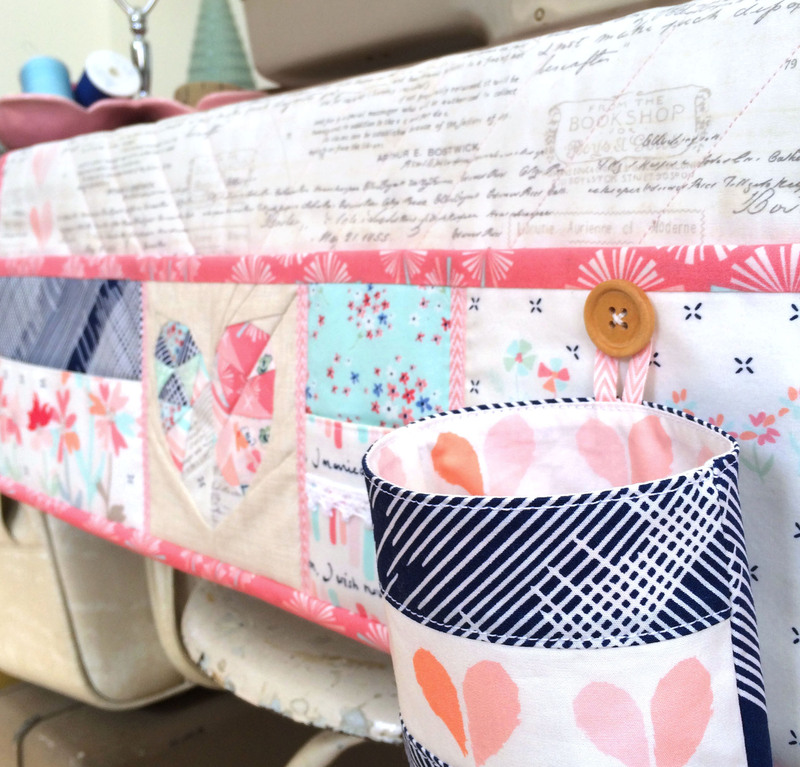 She made it at 85% and used a FQ bundle of Hope Valley. I would have NEVER ever chosen so many bold patterns, but I fell head over heels in love with it from the moment I saw just the little body pieced. This version was made by jeepdog1 for her partner in a rainbow mini swap. Her partner loved batiks and wasn’t a fan of a traditional rainbow. She totally nailed it! The colors are so gorgeous. I saw a photo of this on the recipients wall and it was perfection. This version made by susansanstistevan was also for a rainbow swap. A more traditional rainbow, I love how bold the colors are with the subtle low volume prints. 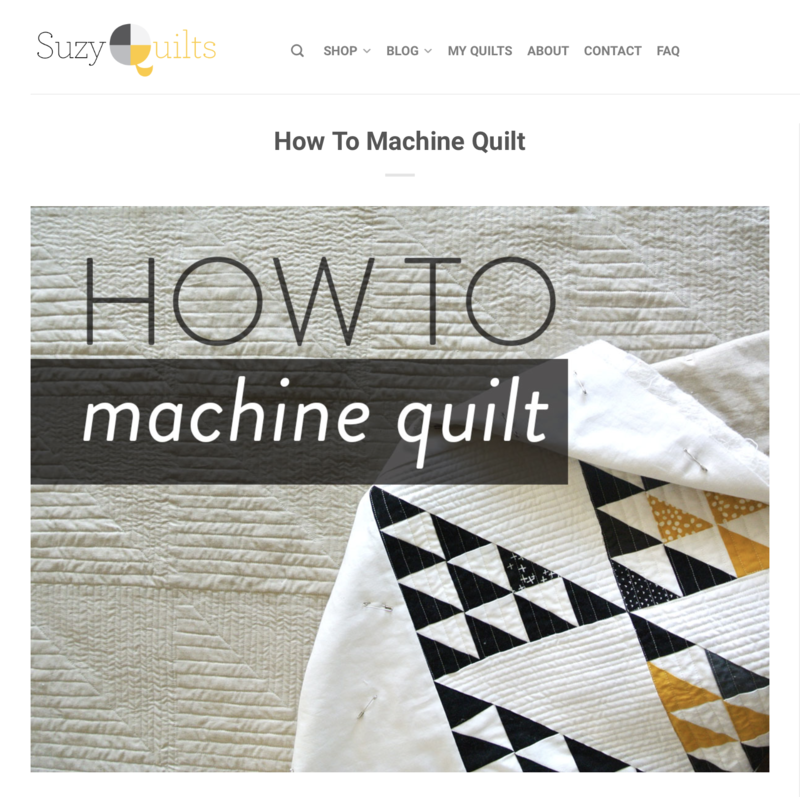 And do I even need to point out that quilting?! I loved seeing this version made by hidehi000 – I had not seen any Bonnie & Camille or similar style fabrics used on the pattern yet and it was really exciting to see how amazing they worked! It gives the piece an entirely different feel. It’s so soft and gorgeous, I could imagine an entire room being designed around it! This version was made by vrrigney for an animal themed swap. She had a partner who loves butterflies, and I’m guessing blue and green! I absolutely love the duotone palette and the pops of navy and bright green in her fabrics. This version is being made by rxquilter and I’m having so much fun watching it come together! Her focal fabric in the top wing is just fabulous and I love how it ties in the hot pink and touch of purple. She is making it for a garden quilt exhibit and I’m dying to see the final photos! This version is being made by sidneysews using Alison Glass fabrics, which I love for this! her mixed background fabrics are awesome and I LOVE the pop of silver metallic. I’m stalking her feed to see the finished product! This version was made by monpetitebiscuit for an Anna Maria Horner swap. These little peeks are killing me! 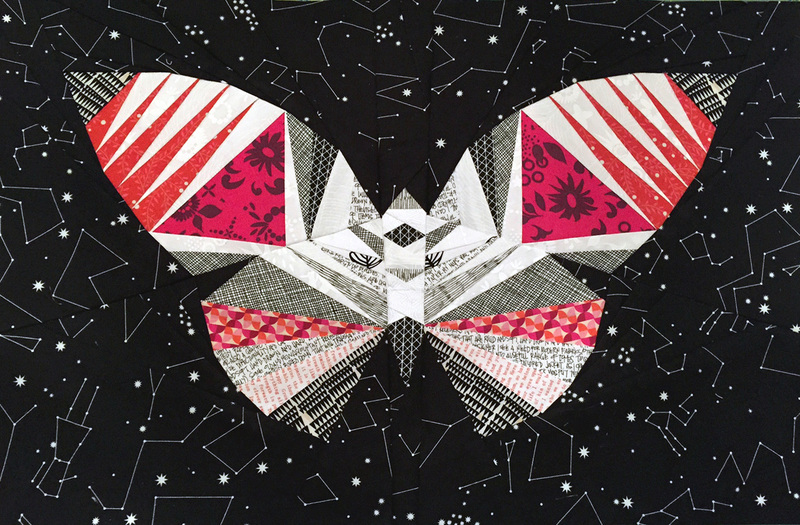 I personally am really drawn to AMH fabrics for this project (probably because she uses a lot of butterflies!) and her colors are so rich and gorgeous. I can’t wait for the full reveal! And last, but certainly not least, this version is being made by mumzy27 for a cotton + steel themed swap. I love the rich jewel tone colors and her use of the rich mustards in the bottom wing. The balance is just perfect! So there you have it! Was this post helpful? Are you feeling inspired? I sure hope so! 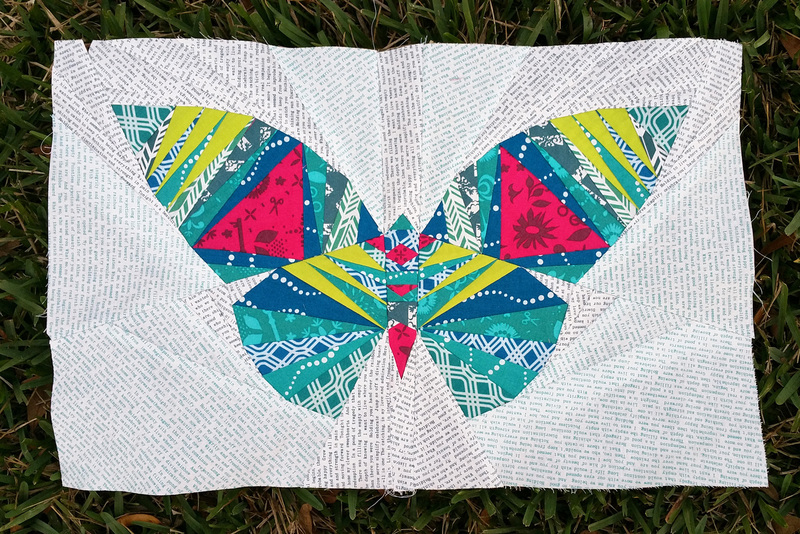 Now get busy creating your Take Wing butterflies and be sure to share your photos with #takewingpattern because I have an awesome giveaway coming up for everyone posting progress or finished photos of their pieces. 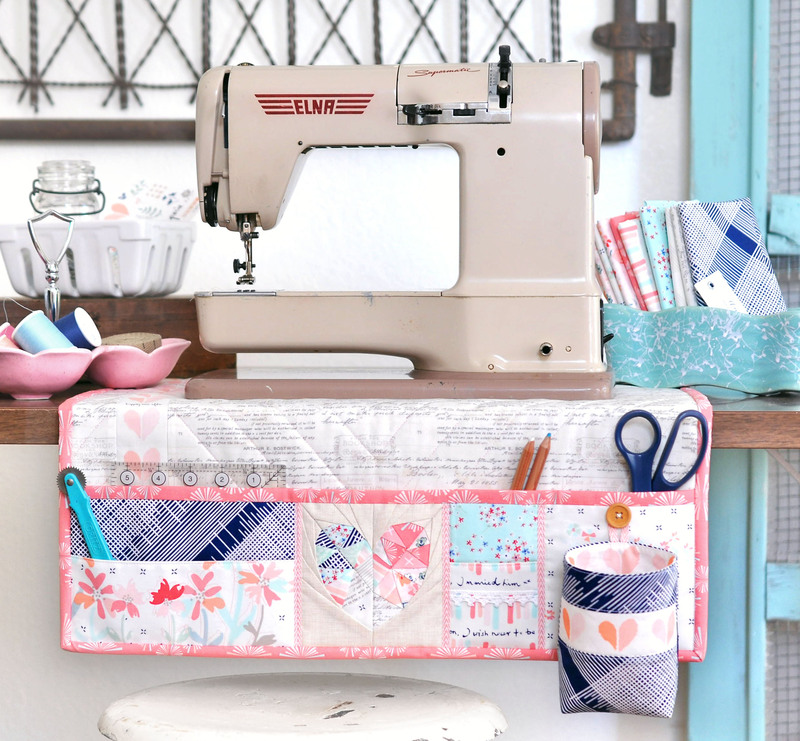 Up for grabs is a handmade fabric stuffed with over $200 of sewing tools, notions and fabric! 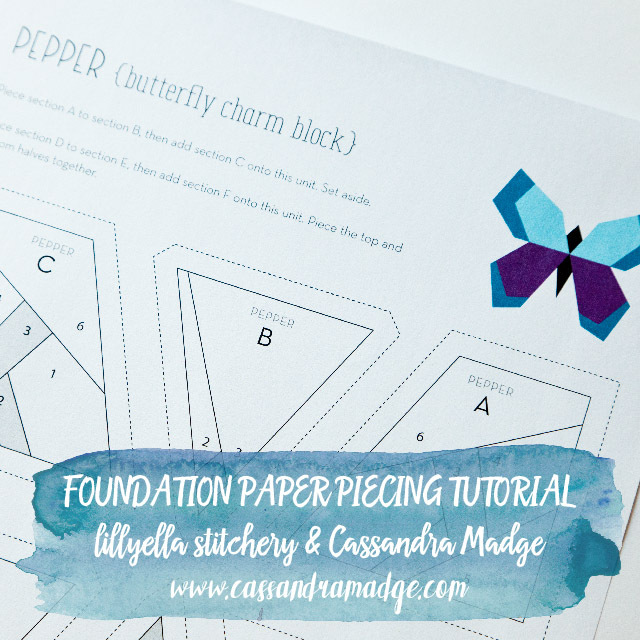 This week I’m going to be talking about tips and tricks for planning, starting, and assembling your Take Wing butterfly! 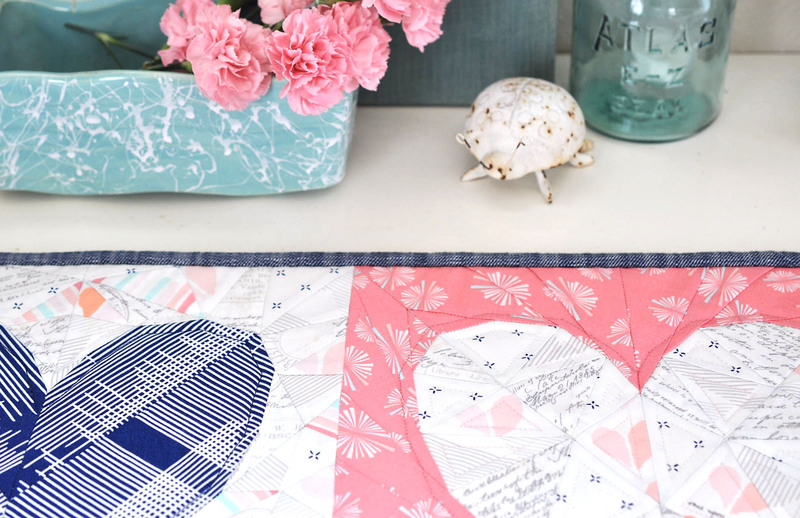 Today I’ll be covering the preparation of your pattern pieces including a couple paper piecing tips that I use and love. Tomorrow I will cover planning, layout and fabric selection (which will probably be a really long post!) and then a few assembly tips and finishing options. Many people use basic printer paper for paper piecing, and it works totally fine! I prefer to use Carol Doaks Foundation Paper. It is inkjet and laser printer friendly and really thin, so it’s easy to sew through and easy to remove. The biggest benefit in using it in a project like this is when it comes to piecing together the sections. Some areas have a lot of bulk along the seam, and thinner paper makes sewing them together much smoother! Alternatively, you can remove the paper from the seam areas before sewing the sections together. Many paper piecing patterns are small and do not require the piecing together of pattern pieces. I touch on this in the pattern directions a bit, but still get a lot of questions about it, so here’s a little bit more detail on the subject. You can use a glue stick or tape to connect your pieces, and it’s really a matter of personal preference. Regardless of which method you choose to use, after printing out your pattern pieces, be sure to leave one from each section uncut. We’ll refer to Wing A for example here. Wing A has three sections. I leave the largest section uncut and then I cut along the dotted line of the two smaller sections. Then you will lay them on top of the uncut piece, lining up the cut edge with the uncut dotted lines, and glue or tape. The advantage to using glue is that you are not sewing through tape! The disadvantage to glue is that sometimes it comes loose and it can also cause a little bit of rippling in your paper. The advantage of tape is that it is easy and sticks together well. The disadvantage is sewing through tape OR possibly ironing over tape, which is a mess, trust me. That being said, I often use tape. I just try to tape inside large areas and not cross over any sewing lines. I also tape on the back side along the loose edge from the overlap of the uncut piece, but you have to be extra careful to not iron over the tape. Once your pieces are together, you can then roughly trim the entire piece down outside of the outer seam line. Do not cut the paper pattern to the outer seam line, as you’ll want that for trimming your sections later. The next step I recommend is tracing the pattern lines onto the back side of the pattern pieces. This step is not necessary, but even as an experienced paper piecer, I find it extremely helpful and worth the little bit of time it takes. You can use a window, your computer screen or a lightbox, if you have one. The tracing doesn’t have to be perfect, as it’s just a reference. 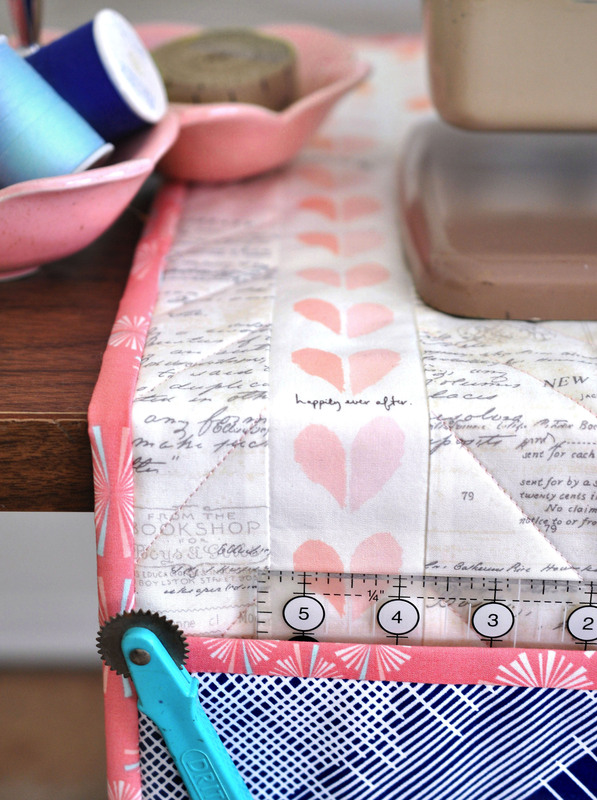 Doing this allows you to easily cut your fabric, double check your work, adjust placement on fussy cuts and check the size of your pieces as you sew. 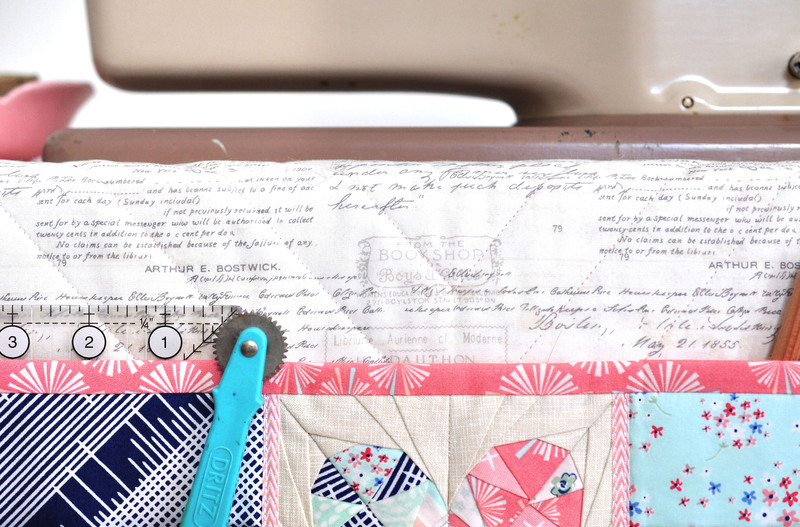 All these things mean less time with your seam ripper! Stop back in tomorrow when I’ll be talking way too much about inspiration, layout, fabric selection, fussy cutting and more – see ya then! Take Wing Pattern now available! You can also purchase the pattern from my Etsy shop here, but because of the VAT tax laws, the PDF will not be an instant download, but will be emailed to you after purchase. This pattern is for the intermediate sewist with paper piecing experience and the finished size is 24″ x 15″. Ultimately, there isn’t anything too complicated about the piecing or the assembly, but there is a lot of pieces to manage and some angled seams to sew together. That being said, an advanced beginner could probably take on this project as well. 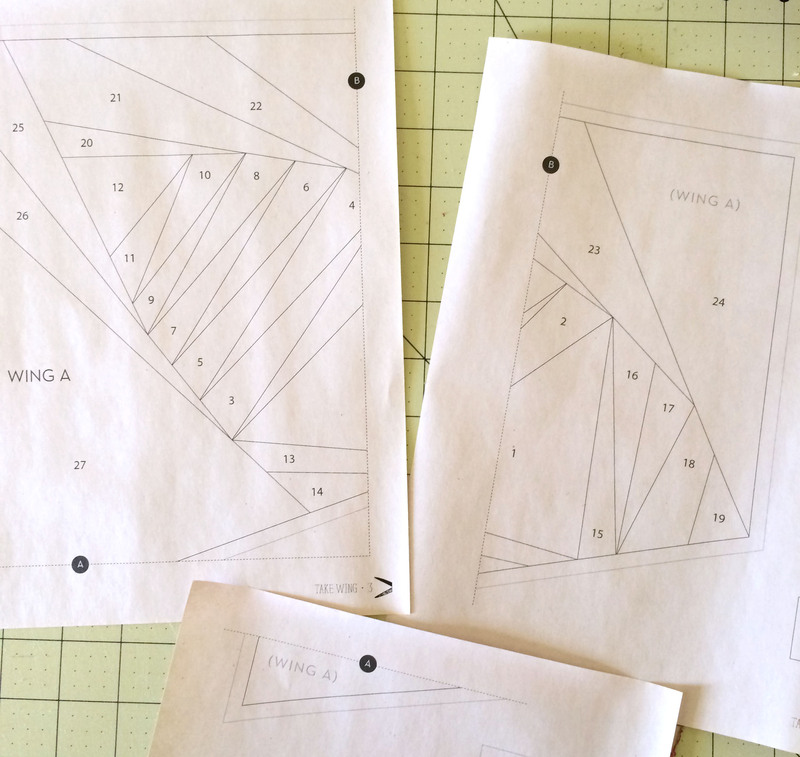 For those who are new to paper piecing, I’m working on a mini Take Wing that will be smaller, simpler, and include full foundation paper piecing directions. It can stand alone but will also include directions on how to combine it with the original for even more fabulous quilt, so stay tuned for that! 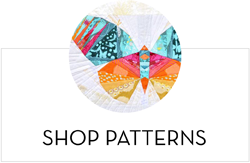 I’ll also be posting lots of photos and helpful tips here and on my instagram and facebook pages, so be sure to follow me or check the hashtag #takewingpattern for these and more inspiration from others creating the pattern. Speaking of inspiration, I’ll wrap this up with a little to get your creative juices flowing! Here are three versions created by my testers, aren’t they amazing? They really showcase the wide fabric and color possibilities you have with this pattern. The above was created by Becca Cleaver (@cleaverr). The constellations in the background are just amazing! This one was created by Charlie Dunn (@travelingcharlie79). She added a border to the pattern and I love the way it really makes the colors pop. This one was created by Alissa Lapinsky (@alissalapinsky). The splashes of red and chartreuse are so beautiful and the texty background is one of my favorite prints. And here are some of my colorings for versions I’m working on. 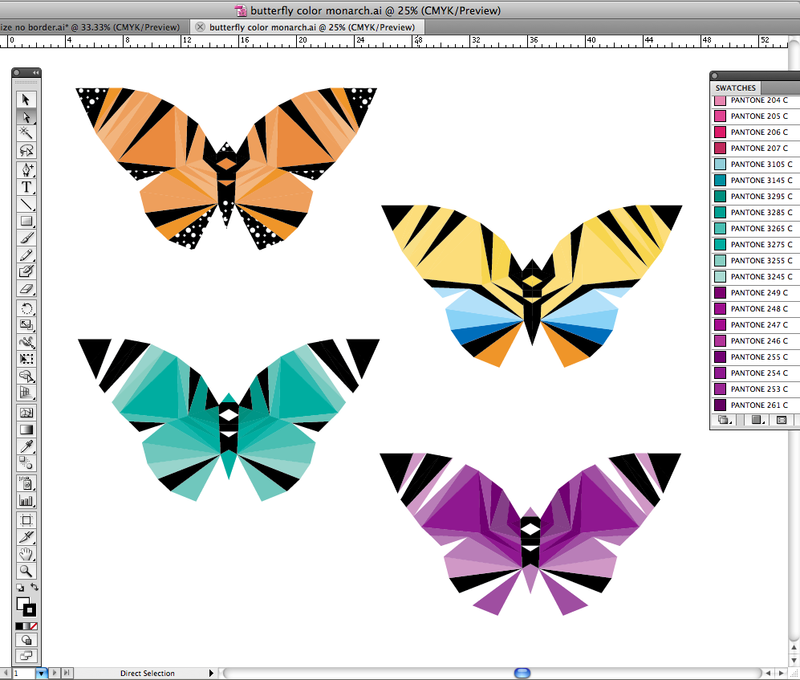 As soon as I get a couple more minis made up, I plan to make a quilt with nine butterflies. Honestly though, planning the colors and fabrics for that is kind of making my head spin! The above shows one color palette, six ways. Which is your favorite? Below you’ll see my version of a monarch, a swallowtail and two monochrome options. 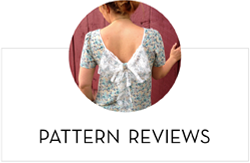 If you have any questions about the pattern or need any help along the way, please don’t hesitate to contact me through my site here or DM me on instagram or facebook. I can’t wait to see all your creations!